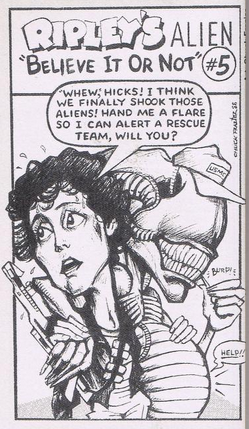 There was also a blurb in this issue quoting Sigourney Weaver: “I won’t do any more Ripley-type roles,” she said. Of course. 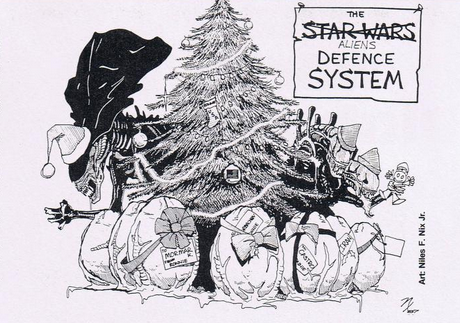 January 1987’s issue 114 had a gloomier sort of letters page, with readers expressing opinions on the Strategic Defense Initiative (SDI, or popularly known as, really, ‘Star Wars’) and also the realities of nuclear war with the Soviets. “It has been suggested,” reads one letter, “that orbiting lasers and/or laser reflecting mirrors could be used to start massive fires in fixed targets like cities – a holocaust without the aid of atomic bombs.” A lot of tension indeed. 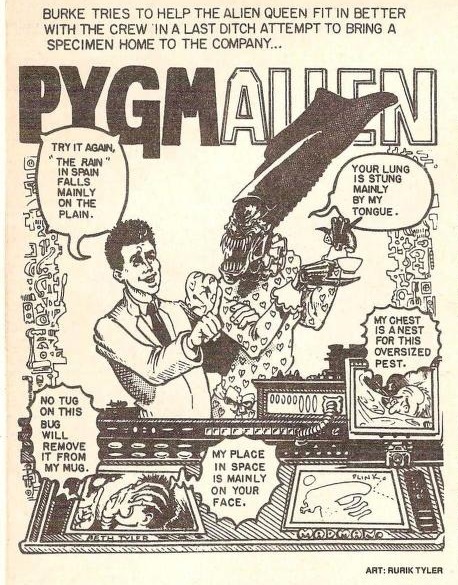 The comic for this issue was drawn by veteran illustrator Mike Fisher. 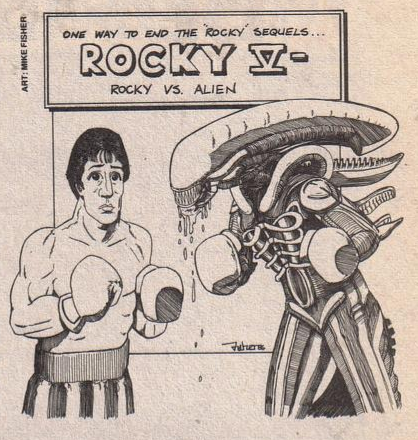 It pitted Rocky Balboa against the Alien, which wasn’t really inspired by anything in the letters pages but played around with an old joke that said Stallone would have to start fighting aliens since his Rocky character had already defeated every challenger on Earth. 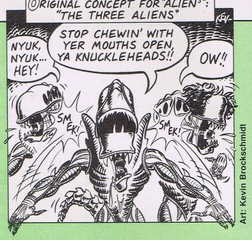 Gags like these actually contributed to that year’s Predator – writers Jim and John Thomas both heard the joke sometime in 1985 and wrote the ‘The Hunter’, a proto-Predator that was “Rocky meets Alien, I guess,” according to its writers. 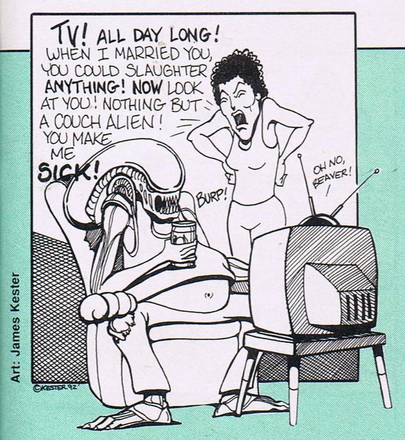 There was a dearth of Aliens articles and interviews at the time, including talks with Jenette Goldstein, Bill Paxton and Lance Henriksen. 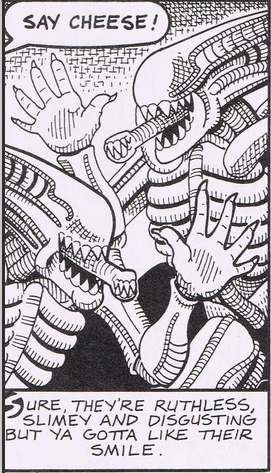 I cannot pinpoint the exact issue that this following panel appeared (bad record keeping) but it’s a nice little ode to Believe It or Not, after which Ellen Ripley was named. 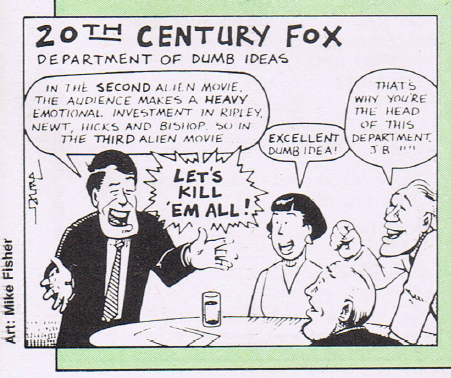 July 1992’s issue 180 had readers writing in to debate Star Trek and Space 1999, and also to express views on the expiring Cold War. George H.W. Bush and Boris Yeltsin had declared that the decades long standoff was over on February 1st of that year, but, obviously, a lot of gloomy feeling persisted. One reader wrote that: “Schwarzenegger’s endorsement of George Bush … makes one seriously doubt that T2‘s ultimate point is in favour of global disarmament” and “our very freedom has been guaranteed by these weapons for 50 years”, along with terms like “Soviet Empire” and “Communist soil” sprinkled throughout. 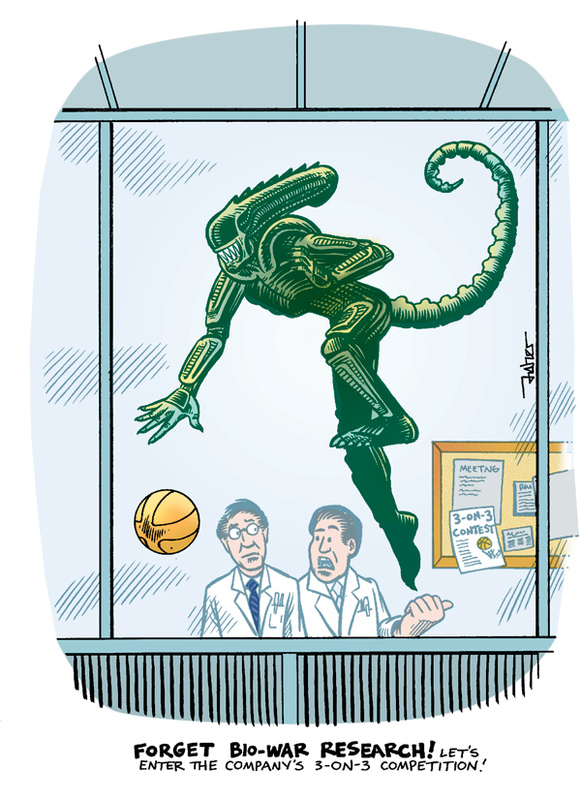 Veering away from such loaded topics, illustrator Mike Fisher again put the Alien up against one of geekdom’s champions. This time, the ever resourceful MacGyver. 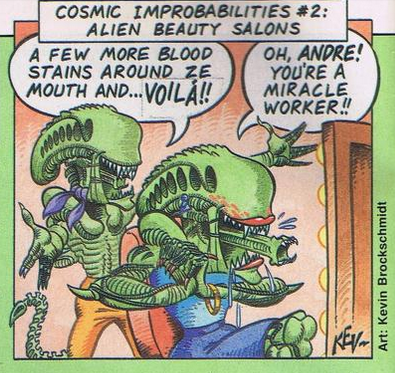 Issue 182 featured another Alien gag as part of its Cosmic Improbabilities line. 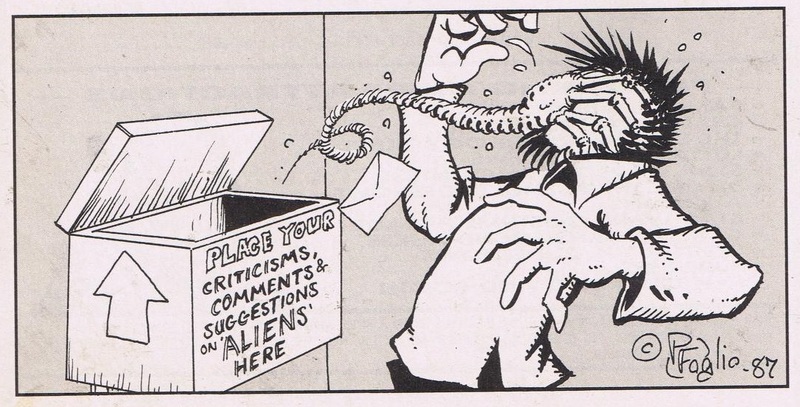 This issue also featured the first of many letters criticising Alien 3, most especially the killing of Newt, Hicks and Bishop during the opening credits. 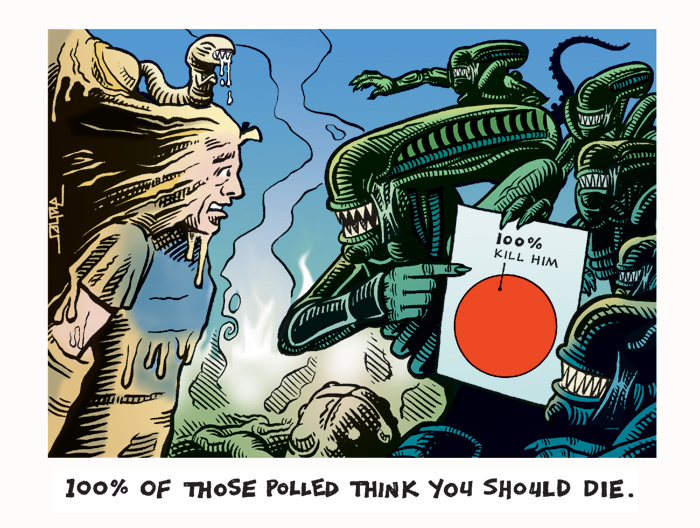 There were predictions (“There will be no Alien 4”) and plaudits and condemnations alike for director David Fincher. 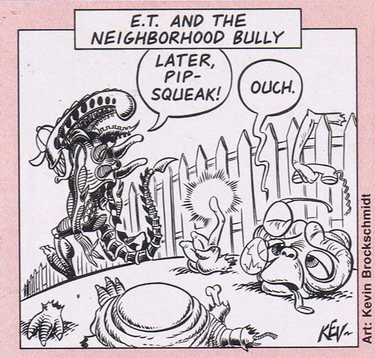 Still, the magazine kept a sense of humour, pitting the Alien against Spielberg’s E.T., having it admire Ripley’s dome and joining the Enterprise crew once again. 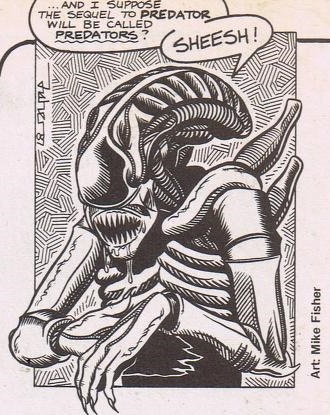 The nineties were the primetime of Alien merchandise, specifcially comics, games and toys. 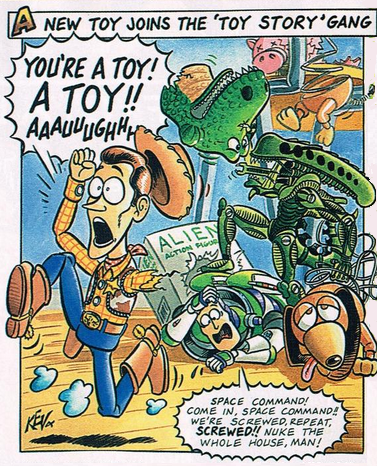 Issue 229, released in August 1996, poked fun at this by throwing the Alien into a Toy Story scenario. 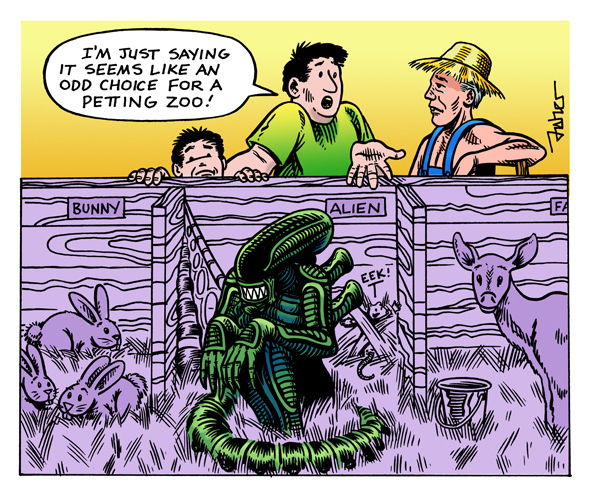 It’s a nice little toon, especially when you consider that Toy Story had Joss Whedon as one of its writers, and Joss had written Alien Resurrection, which was less than a year from release at the time. 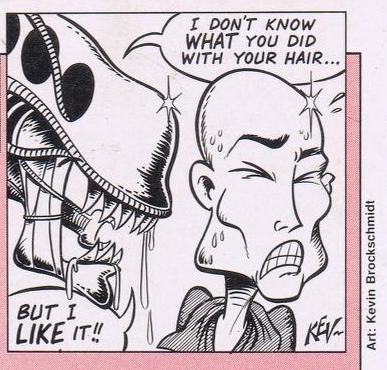 The following cartoons were graciously given to me by artist Mike Fisher, and they appeared in various Starlog issues during 2004-08. 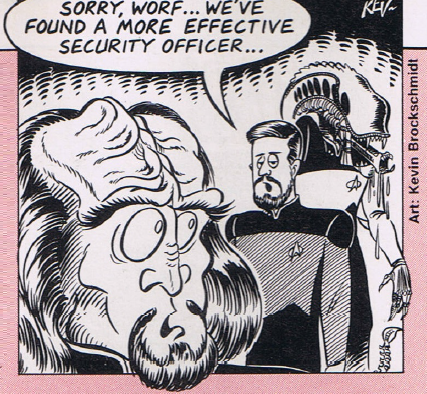 Starlog itself sadly petered out. It celebrated its 30th birthday in 2006, but was bankrupted and eventually sold in 2008. 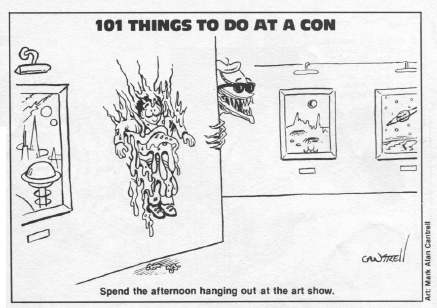 The year before a warehouse containing back issues of both Starlog and Fangoria magazine burned to the ground. 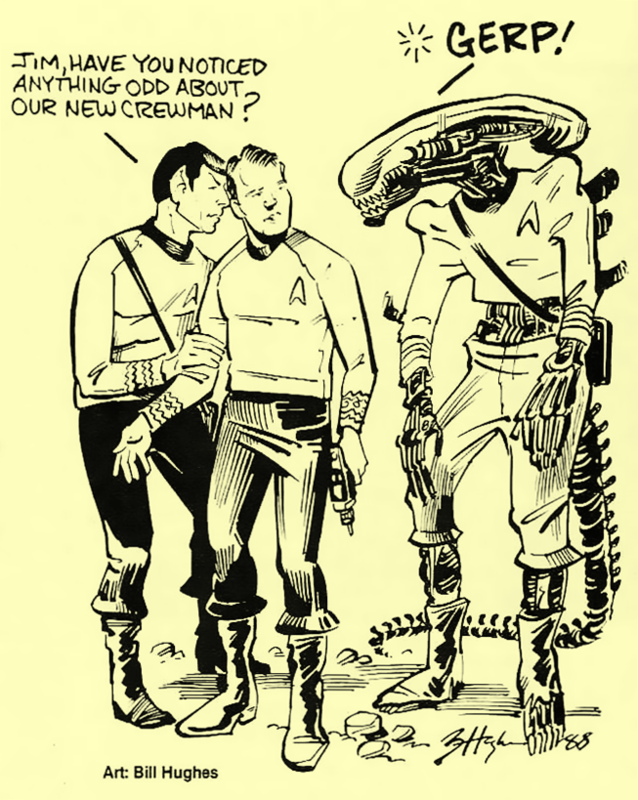 The magazine still persists online, and can be visited at Starlog.com. 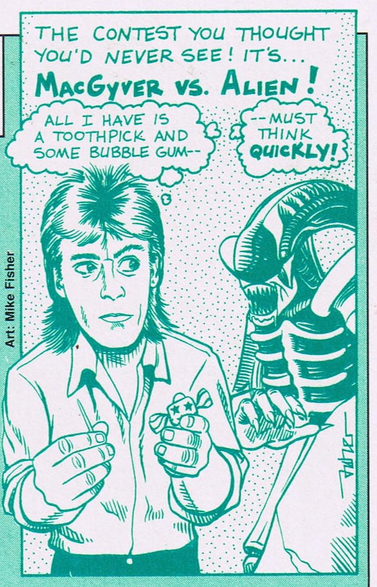 I remember the ‘Ripley’s Believe It Or Not’ one and the ‘MacGyver’ ones from when they were reprinted in either The Dropship fanzine or the AFC one, Millenium. Never knew they weren’t fan originals! Excellent Valaquen, Keep them coming. “My place in space is mainly on your face” made me laugh. 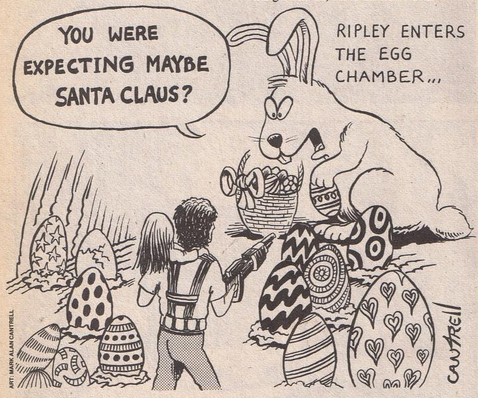 I miss ’70s & ’80s Starlog (and Fantastic Films & Cinefantastique). More recent additions to this are the wonderful online series of photos for Alien Loves Predator (www.alienlovespredator.com) that utilise some amazing cosplay costumes, also recently released is The Alien Next Door cartoon book by Joey Spiotto, that I first spied in an amazing scifi store in Iceland of all places, thankfully it’s more widely available than that and very sweet. Having said that, I’m very much looking forward to Covenant and Bloomkampf’s efforts to revive a more visceral alien fear as constant ‘cutesifying’ of it in toys and print are in danger of rendering it ineffective. Rather like how the recent Rogue One has done a great job of reminding Star Wars fans that meeting Darth Vader in a darkened corridor would be terrifying, hopefully they can similarly nail it.